The orthopedic space is a treasure trove of opportunity for private equity investors, according to Provident Healthcare Partners Analyst Robert Aprill. 1. Mount Pleasant, S.C.-based Southeastern Spine Institute recapitalized with Candescent Partners in April 2017. The level of private equity interest this transaction generated indicated orthopedics would be the next specialty to undergo significant investment and consolidation. Becker’s ASC Review features general business, legal and clinical guidance on topics relevant to outpatient surgery including joint-ventures, development and expansion, and regulatory and compliance issues; as well as analysis and insight for specialties including bariatrics, orthopedics and spine, gastroenterology, neurosurgery, ophthalmology, ENT and anesthesiology. Each of the nine annual issues of the publication reaches a qualified audience of more than 25,000 key ASC leaders, including surgeons, medical directors, directors of surgery and ASC administrators. 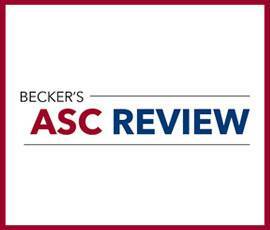 Further, every ASC in the nation receives Becker’s ASC Review. Visit Becker’s ASC Review at https://www.beckersasc.com/.